Become a Yoga Alliance Certified teacher with an emphasis on Ayurvedic Science and Anatomy. 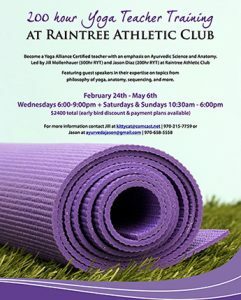 Led by Jill Mollenhauer (500hr RYT) and Jason Diaz (200hr RYT) at Raintree Athletic Club. Featuring guest speakers in their expertise on topics from philosophy of yoga, anatomy, sequencing, and more.